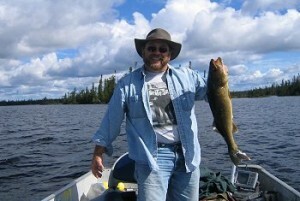 Showing off his catch is Charlie Chernak, of Bear Island Land Co., one of our Minnesota Preferred Brokers. One of the most enjoyable things about owning a piece of Potlatch property can be taking advantage of your own slice of fishing heaven. Even if there isn’t a stream, creek or lake on your property, there’s often a body of water nearby where you can cast your line and wait for the fish to bite. But if you’re a fishing novice, or if your last few outings have proved frustrating, it’s good to review a few basics before you bait your hook. Oh, snap! Line breakage is perhaps the most common reason for failing to land a fish. Respool all reels with fresh line at the start of the season and keep an eye out for nicks and abrasions on the line. Make sure your hooks are sharp. A dull or rusted hook isn’t going to land much of anything. Test hooks by lightly touching the point to the back of your thumbnail. If the point bites, you’re in business! Be patient. Many anglers move too quickly to a new location when the bites start to slow. However, you’re usually better off staying with fish that are biting, even sporadically, than to go looking for more active fish elsewhere. The love of a lure can be a pitfall. Buying the same lure in a rainbow of colors is pointless if it has failed to produce. Instead, stock your tackle box with an assortment of offerings. Practice makes perfect. If you’re having trouble getting the line in the payoff zone, practice casting in a grassy area using a bucket or something similar for a target. Concentrating on your cast on land may make you more successful when you’re on the water. Hooked on…? Many anglers focus on just one species of fish which means they might be missing out on other opportunities. There’s often more than one desirable species in any body of water. Slacking off. When it comes to fishing, a slack line is the enemy. Savvy anglers know keeping a tight line and a bend in the rod is essential to reeling in a catch. Perhaps the most important thing to remember is to keep your expectations in check. It doesn’t really matter if you come home with a full catch or empty-handed as long as you’ve enjoyed the experience. Remember, fishing can be fun with or without the fish! This entry was posted in Minnesota, PotlatchDeltic and tagged bait, Bear Island Land Co., Charlie Chernak, fishing, Fishing Tips, hook, lure. Bookmark the permalink. ← Spring into our latest newsletter!